How good do these beetroot donuts from SpamellaB look? Her blog and social media are an excellent source of ways to indulge healthily, we recommend you check them out for yourself. Preheat the oven to 180 degrees C and grease a 6-hole donut tin. Place the banana(s), maple syrup, coconut oil, almond milk, beetroot concentrate, vinegar and vanilla in a blender and whizz up until smooth. Mix the oat flour, ground almonds, flaxseeds, cinnamon, baking powder and bicarbonate of soda in a large bowl. Pour in the wet ingredients and mix well to form a pink batter. Divide this between the donut holes to reach the top and smooth out. Bake for 20 minutes, until risen and firm. Leave to cool then turn out onto a wire rack. Meanwhile make the frosting: Beat together the ingredients and keep in the fridge until needed. When your donuts have cooled, spread each donut with the frosting to cover, then sprinkle with freeze-dried raspberries. Now enjoy! Keep any remaining donuts in an airtight container in the fridge for up to 3 days. SpamellaB is at it again with this fantastic recipe, who doesn’t enjoy a good citrus flavoured muffin. Her blog and social media are an excellent source of ways to indulge healthily, we recommend you check them out for yourself. Preheat the oven to 180C and lightly grease a muffin tin. Mix together the flours, ground almonds, stevia, lemon zest, baking powder and bicarbonate of soda in a large bowl. Whisk the milk, vanilla, coconut oil and vinegar then pour into the dry ingredients and mix to combine. Stir in the blueberries only slightly. Divide the mixture between the 6 muffin tins to reach the top and bake in the oven for 10-15 minutes until risen. Leave to cool in the tin. Whisk together the drizzle ingredients then once the muffins have cooled, drizzle over. Scatter over some extra lemon zest – now enjoy! 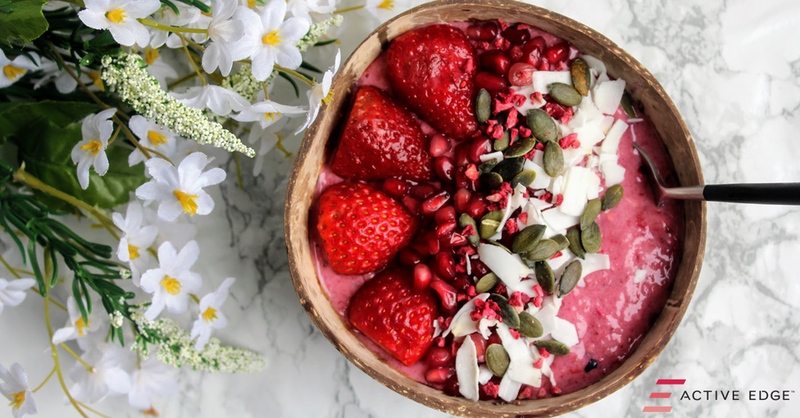 SpamellaB has created this amazing smoothie bowl featuring our PomegranateActive concentrate. Smoothie bowls are an ideal way of enjoying a brain and body boosting breakfast, fuelling or re-fuelling exercise, a healthy snack or as an after dinner treat. Place the frozen banana, berries, PomegranateActive and yogurt in a blender and whizz up until thick and smooth. Spoon into a bowl then decorate to make it look pretty – then dig in! Looking for a different way to use your Active Edge BeetActive? Why not try this great recipe by SpamellaB. First make the tartlets case: Mix together the oat flour, ground almonds, coconut flour and cacao powder in a bowl. Pour in the almond milk, melted coconut oil, maple syrup and vanilla and mix well to combine to form a dough-like texture. Press into 4 x small loose-bottom tartlet tins to cover the bottom and up the sides. Chill in the fridge while you make the filling. Pour the can of coconut milk into a small pan and whisk in the beetroot concentrate and maple syrup and place on a medium-high heat. Whisk the cornflour in a cup with 1-2 tablespoons water to form a paste then stir this into the pan. Whisk continuously and cook for a few minutes until the sauce has thickened. Remove from the heat, stir in the vanilla and set aside to cool. Once cooled, spoon the filling into each of the cases and sprinkle over the decoration. Chill again for at least 30 minutes until ready to serve. To celebrate the launch of PomegranateActive we asked SpamellaB to create some recipes featuring our new product. She hasn’t let us down here’s the first for you to try. Mix together the oats, puffed rice, coconut and seeds in a large bowl. Melt the coconut oil, maple syrup and nut butter then set aside and leave to cool slightly. Whisk in the PomegranateActive. Pour this into the dry ingredients and mix together really well – it should be a little sticky and come together nicely. Line a 9 x 9in baking tin with greaseproof paper then tip the mixture in and spread out evenly. Pack it in really tightly then chill in the fridge for at least 2 hours. Melt the chocolate and coconut oil on a low heat, then pour this over the top to cover. Scatter over the pomegranate seeds and raspberries then return to the fridge for at least 2 hours to set. When you’re ready to serve, lift out the whole batch and place on a chopping board. Cut into 9-12 bars then enjoy! This great recipe was given to us by our ambassador Kate McCall, it’s a great simple breakfast option, so get your waffle irons at the ready! Mix together the oat flour, whey protein, flax seed and baking powder. Add the milk and eggs, mix until blended. Allow mixture to sit for 5 minutes until its thickened slightly. If it is too runny add more oat flour. 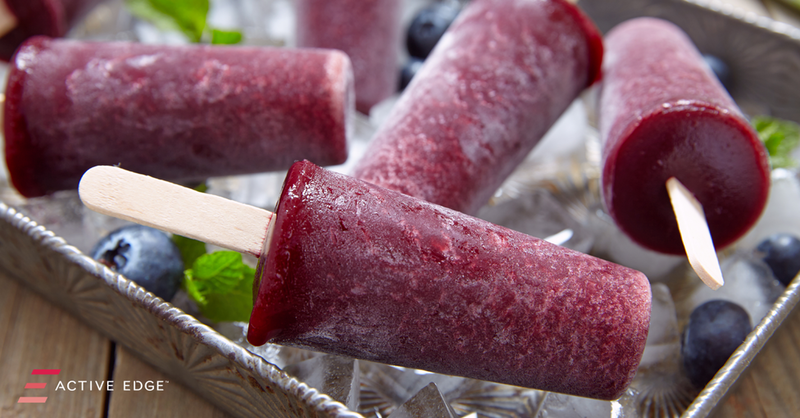 You can top with raspberries, blueberries and maple syrup! Health food blogger SpamellaB has created this fantastic recipe to help you indulge innocently this Valentines Day. Her blog and social media are an excellent source of ways to indulge healthily, we recommend you pay them a visit. Drain the cherries then place all the ingredients in a food processor and blitz well until the nuts and dried fruit have broken down and the mixture comes together. Divide this between 4 individual silicone cheesecake moulds – heart ones if possible! Press down to cover the base and reach about ¼ of the way to the top. Freeze. Now make the coconut layer: Scrape the solid cream from the can and place in a food processor with the other ingredients. Whizz up until completely smooth and quite thick. Spoon this between the moulds to cover the base and reach just to the top. Arrange your fruit, nuts and chocolate on top of each, the return to the freezer for at least 4 hours to completely set. When you’re ready to serve, remove from the freezer 10 minutes before then pop out of the moulds and onto a serving plate. Now enjoy!